Beginning of the Liturgical Year. AGIA (AIA, AYE), (Sixth Century), mother of St. Lupus of Sens (vide infra), she was a woman of great holiness who has been venerated as a saint since her repose. ARCANUS, following a pilgrimage to the Holy Land, St. Arcanus founded a monastery to enshrine relics which he had brought back. This monastery grew to become Borgo Santo Sepolcro in Tuscany. Circa 1050 is given as the year of his repose. CONSTANTIUS, a Bishop of Aquino (Aquinum) in Lazio (present-day Italy). St. Constantius is mentioned by Pope St. Gregory the Dialogist (3rd September) in his Dialogues , and was known for his gift of prophecy. St. Constantius reposed circa 520. FIRMINUS of AMIENS, (Fourth Century), named for St. Firminus (25th September), who, as first Bishop of Amiens in Picardy, had baptised his father, this St. Firminus was third Bishop of Amiens. GILES (ÆGIDIUS, GILLES), (Eighth Century), there is little in the way of reliable information on his life. St. Giles is believed to have been born in Athens, but seems to have gone to what is today Languedoc and Provence in France. There he lived primarily as a hermit, though is said to have founded an abbey in what is now the town of St-Gilles-du-Gard. The tomb in this abbey, which was rededicated to him in the tenth century, became a place of pilgrimage and a stop on the road from Arles to Santiago de Compostela. The cultus of St. Giles quickly spread throughout Europe, with numerous churches and monasteries dedicated to him in Britain, France, Germany, Hungary, Poland, Slovakia, and Spain. LUPUS (LEU) of SENS, (Seventh Century), a member of the royal house of the Kingdom of Burgundy, who served as the nineteenth Bishop of Sens in Burgundy. LYTHAN (LLYTHAOTHAW), St. Lythan is the patron saint of two churches in the Diocese of Llandaff. Nothing further, including the years he flourished, is known of his life. NIVARD, Bishop of Rheims from sometime before 657 until his repose circa 670. St. Nivard is buried at Hautvilliers Abbey, which he had restored. PRISCUS, according to tradition St. Priscus was one of the Seventy, and that he accompanied the Apostle Peter (29th June) to Italy, and may have been the first Bishop of Capua in Campania. It is believed to have been martyred under Nero, circa 66. PRISCUS, CASTRENSIS, TAMMARUS, ROSIUS, HERACLIUS, SECUNDINUS, ADJUTOR, MARK, AUGUSTUS, ELPIDIUS, CANION, and VINDONIUS, St. Priscus, was a bishop in North Africa, who along with his priests, was exiled by the Arian Vandals. Finding sanctuary in southern Italy they applied themselves to pastoral work and preaching the Gospel. 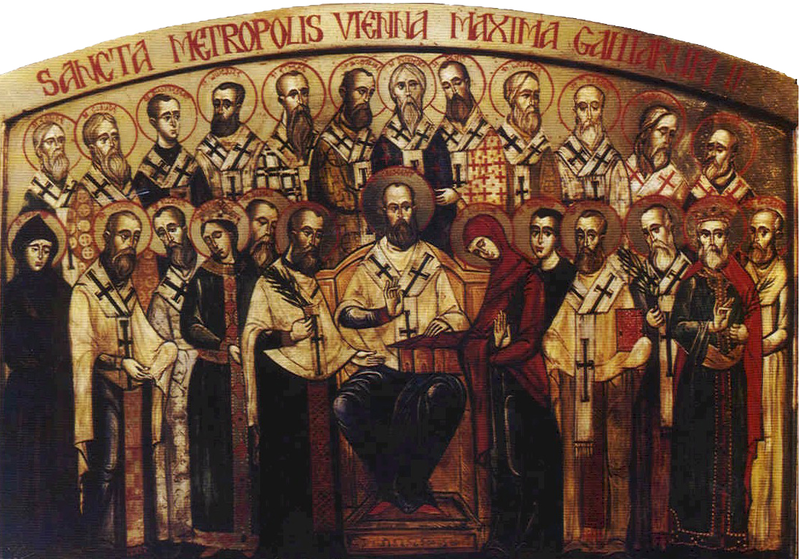 It is possible that some of them were appointed bishops of the Sees in which they had served. REGULUS, a native of Africa who was forced into exile by the Arian Vandals. He settled in Tuscany, but seems to have been martyred during the Ostrogoth invasions under Totila (circa 545). SIXTUS (XYSTUS) of RHEIMS, the first Bishop of Rheims, there are several traditions about him, but the most likely one says that he founded the Sees of Rheims and Soissons, having been sent to evangelise Gaul by Pope St. Sixtus II (6th August). St. Sixtus reposed circa 300. Nothing more can be stated with any certainty about his life. TERENTIAN, a Bishop of Todi in Umbria who is said to have been arrested during Hadrian’s persecutions. In 118, after being tortured on the rack, and having his tongue cut out, St. Terentian was beheaded. TWELVE HOLY BROTHERS, there are two traditions regarding these saints. One is that they are the children of SS. Boniface and Thecla (30th August), and were martyred shortly after their parents. However, there is no reliable account of their martyrdom extant. The other is in 760, the relics of a group of martyrs in southern Italy dating from circa 303, were gathered together and enshrined in Benevento, Italy as a group then called the “Twelve Holy Brothers”. VERENA, (Third Century) a native of Egypt who travelled to Switzerland in search of a relative who was a member of the Theban Legion (22nd September). St. Verena eventually settled as an anchoress near Zürich. VIBIANA (BIBIANA), (Date Unknown), an early virgin-martyr of whom nothing is known. The relics of St. Vibiana are enshrined in the mausoleum of the Roman Catholic Cathedral of Our Lady of the Angels, in Los Angeles California. VICTORIUS, sixth Bishop of Le Mans from circa 453, until his repose circa 490. He is said to have been a disciple of St. Martin of Tours (11th November). St. Gregory of Tours (17th November) attested to his miracles and holiness of life. VINCENT and LAETUS, (Date Unknown), two Spanish martyrs who have traditionally venerated in Toledo Spain. CÆREALIS and SALLUSTIA, St. Cærealis a soldier, and his wife St. Sallustia, were catechumens of, and baptised by, Pope St. Cornelius (16th September), with whom they were martyred during the Decian Persecution in 251. CORMAC, St. Cormac, a King of Munster, was most likely the first Bishop of Cashel in Ireland. Though the reliability of some of the traditions concerning St. Cormac is questionable, he is reputed to have been a great scholar. The authorship of the Sanas Cormaic (Cormac's Glossary) , and the now-lost Psalter of Cashel , among other works, have been attributed to him. St. Cormac reposed in 908. CRESCENTIAN, VICTOR, ROSULA, and GENERALIS, said to have been martyred in Carthage along with St. Cyprian (16th September), circa 258. CRESCENTIUS, according to tradition, St. Crescentius was the eleven-year-old son of St. Euthymius (29th August). It is said that following the martyrdom of his father, St. Crescentius was brought back to Rome where, even under torture, he proclaimed his faith in Christ, and was subsequently beheaded, during the Diocletianic Persecution circa 300. However, this is all based upon a Life which dates from 1600, and hence, is of questionable veracity. MATERNUS, the first known Bishop of Cologne. He founded a church at the site upon which Cologne Cathedral (Kölner Dom) now stands. St. Maternus reposed circa 325.